Watford boss Gianfranco Zola has spoken of his disappointment at criticism of his club's loan policy. The Hornets, third in the Championship, have 10 players on loan from sister clubs Udinese and Granada. "I think it's very unfair. We're not doing anything [wrong] - we haven't breached any rules," said Zola. "All we do is play football out there and we're winning games playing well and playing fair. I think a lot of the criticism is quite unfair." Watford currently have 10 players on their books from Udinese and Granada - teams who are also under the umbrella of Hornets owners the Pozzo family - as well as Standard Liege's Geoffrey Mujangi Bia. It is a system that has helped them win six of their last eight league games, culminating in Tuesday's 2-0 win at Ipswich, when seven of the Udinese-Granada contingent were named in the squad. Crystal Palace boss Ian Holloway has questioned the rules which allow it to occur and voiced his concern for young English players coming through at Vicarage Road. And reports have suggested the rules could be reviewed for next season. "Don't forget, people say things, but we have a lot of English players in the team, and a lot of them are young players," said former Chelsea striker and West Ham boss Zola. "I don't want to talk too much about it because football is on the pitch and I believe that Watford are doing very well and deserve to be praised for that." While the loanees were influential in the victory over Ipswich, the strength and determination of striker Troy Deeney and composure of midfielder Jonathan Hogg - both Englishmen - made them stand-out players on the night, while defenders Nyron Nosworthy and Lloyd Doyley were strong at the back. "Troy Deeney is the heart, as is Jonathan Hogg. 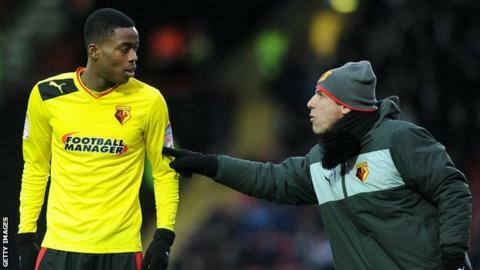 And Lloyd Doyley has been exceptional," said Zola. "If you ask my players they are enjoying it together. There is no difference between them. That's the thing that pleases me the most." Ipswich boss Mick McCarthy was asked for his thoughts on the situation after the game and gave the question short shrift. "I don't give a hoot what they're doing personally," he said. "If it's within the rules, it's within the rules. Let them get on with it. We've played against a better team than us who have played within the rules of the game. "You won't get me moaning about it." Read more on Ian Holloway: Crystal Palace boss questions Watford loan "loophole"